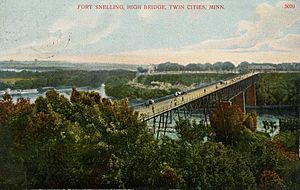 Fort Snelling, originally known as Fort Saint Anthony, was a military fortification located at the confluence of Minnesota and Mississippi Rivers in Hennepin County, Minnesota. Mississippi National River and Recreation Area, a National Park Service unit, includes historic Fort Snelling. Fort Snelling also refers to an unorganized territory in Hennepin County, Minnesota, containing the former fortification. The Census in 2000 enumerated a total population of 442. The Minnesota Historical Society now runs the fort, located atop a bluff along the river. Minnesota Department of Natural Resources runs Fort Snelling State Park, protecting the land at the bottom of the bluff. 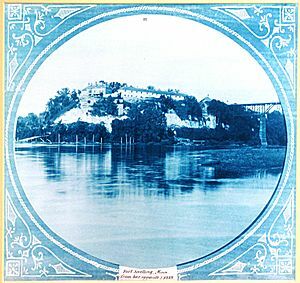 Fort Snelling once encompassed both parcels. The fort is a National Historic Landmark and has been named a "national treasure" by the National Trust for Historic Preservation. Lieutenant Zebulon Pike in 1805 acquired Pike's Purchase for the United States, comprising 100,000 acres (400 km²) of land in the area. Significant settlement began in the late 1810s. Following the War of 1812, the United States Department of War built a chain of forts and installed Indian agents between Lake Michigan and the Missouri River. These forts primarily protected the northwestern territories from Canadian and British encroachment. The Army founded Fort Saint Anthony in 1819. Colonel Josiah Snelling commanded the 5th Infantry Regiment (United States). Its soldiers constructed the original Fort Saint Anthony from 1820 to 1824. During construction, most soldiers lived at Camp Coldwater, which provided drinking water to the fort throughout the 19th century. The post surgeon began recording meteorological observations at Fort Saint Anthony in January 1820, beginning one of the longest near-continuous weather records in the country. Upon its completion in 1825, the Army renamed the fort as Fort Snelling in honor of its commander and architect. The soldiers at the northwestern frontier outposts tried to restrict commercial use of the rivers to United States citizens, keep American Indian lands free of white settlement until treaties permitted it, enforce law and order, and protect legitimate travelers and traders. At Fort Snelling, the garrison also attempted to keep the peace between the Dakota people. Colonel Snelling suffered from chronic dysentery, and bouts of the illness made him susceptible to anger. Recalled to Washington, he left Fort Snelling in September 1827. Colonel Snelling died in summer 1828 from complications due to dysentery and a "brain fever". John Marsh, a native of Danvers, Massachusetts, came to the fort during the early 1820s. At the fort, he set up the first school for children of the officers. He also developed a good relationship with the local Sioux tribe, and developed a dictionary for the Sioux language. He had been studying medicine at Harvard for two years before deciding to leave school without earning a degree. He used this opportunity to "read medicine" under the tutelage of the post physician, Dr. Purcell. The physician died before Marsh completed the two-year course, so he still had no medical degree. 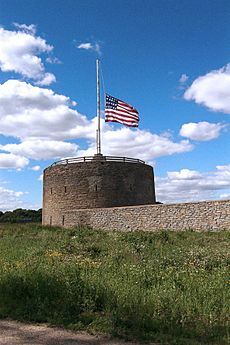 In 1830 Fort Snelling was the birthplace of John Taylor Wood, who later became known as a lieutenant in the Confederate navy, serving on board the Merrimack at the Battle of Hampton Roads. John Emerson purchased the slave Dred Scott in Saint Louis, Missouri, but he later worked and lived at Fort Snelling during much of the 1830s, having brought Dred and his wife Harriet Scott with him. The Missouri Compromise made slavery illegal in Minnesota Territory. Emerson took the Scotts back to Missouri, a slave state, where they sued for their freedom and that of their daughters, because they had been held illegally in a free territory. A longstanding precedent of "once free, always free" was overturned in this case, and the United States Supreme court case of Dred Scott v. Sandford (1857) ruled that the Missouri Compromise was unconstitutional and that African Americans had no standing under the constitution. Career Army officer and artist Seth Eastman had two tours here, the second a lengthy one in the 1840s when he commanded the fort. He did many paintings and drawings of the Dakota and other Native American peoples while here, and helped record their customs and lives. He was commissioned by Congress to illustrate the six-volume study of Indian Tribes of the United States by Henry Rowe Schoolcraft, which was published 1851-1857 with hundreds of his works. During the American Civil War, Franklin Steele leased Fort Snelling back to the War Department for use as an induction station. More than 24,000 recruits from Minnesota were trained here. During the Dakota War of 1862, the Army used it as the base of a concentration camp, holding hundreds of Dakota women, children, and elders as captives on the river flats below the fort through the winter of 1862–63. Hundreds died there. 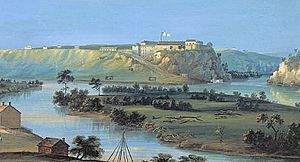 After the war, Steele leased the land around Fort Snelling to settlers, and Minneapolis began to expand into the fort's surroundings. The United States Army assigned a garrison to Fort Snelling. The fort dispatched forces to protect the interests of the colonizers on the frontier from the Dakota people, westward to the Rocky Mountains. Soldiers from Fort Snelling fought in the Indian Wars and the Spanish–American War of 1898. Through World War II, the War Department chose Fort Snelling as the location for the Military Intelligence Service Language School to teach the Japanese language to Army personnel. 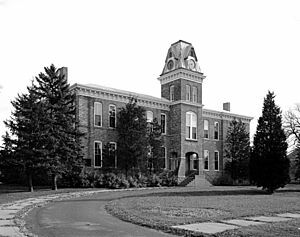 The War Department constructed scores of buildings for housing and teaching, and the school processed 300,000 soldiers. The school was relocated to Monterey, California after the war, in June 1946. The War Department decommissioned Fort Snelling on 14 October 1946, and various federal agencies took parcels from the grounds of the old fort. The majority of the structures fell into disrepair. In 1960, it was listed as a National Historic Landmark, citing its importance as the first major military post in the region, and for its later history in the development of the United States Army. Fort Snelling nevertheless continued to serve as headquarters of United States Army Reserve 205th Infantry Brigade, which comprised three light infantry battalions and attached field artillery, cavalry, air defense artillery, combat engineers, and supporting logistics units throughout the Upper Midwest. The Defense Department deactivated this unit in 1994 as a part of force-structure eliminations. Over the decades, the Army interred many deceased Minnesotan soldiers and other members of the United States Armed Forces at Fort Snelling National Cemetery. Some military facilities continue to operate around old Fort Snelling. The Minnesota Historical Society has converted the area of the original walled fort into an educational establishment, rebuilt to resemble its original appearance, and staffed during the spring, summer and early fall with costumed personnel interpreting life at the early post. Although restoring and re-creating the original fort assures its survival as a historical artifact for the foreseeable future, many briefly used buildings of the fort gradually fell into serious disrepair and neglect. 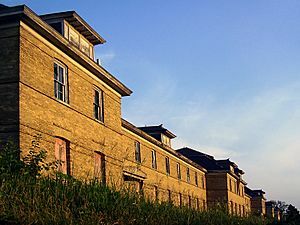 In May 2006, the National Trust for Historic Preservation added Upper Post of Fort Snelling to its list of "America's Most Endangered Places". Some restoration on historic Fort Snelling continues, and crews removed the flagpole from the iconic round tower and placed it in the ground, a change since its opening as a historic fort. The United States Navy named an amphibious warfare ship, the USS Fort Snelling (LSD-30), to honor the fort. The fort is located on Fort Snelling Unorganized Territory, an unincorporated area and division of Hennepin County lying just east of the city of Richfield. It is also adjacent to the cities of Minneapolis, Bloomington, Saint Paul (across the Mississippi River), and Mendota Heights (across the Minnesota River). The fort is located at the eastern end of the territory, near the confluence of the Mississippi River with the Minnesota River. Fort Snelling unorganized territory contains numerous military and other federal facilities. These facilities include historic Fort Snelling, its cemetery, and the Minneapolis Veterans Health Administration Medical Center. Minneapolis–St. Paul International Airport, however, includes most of the land area of the unorganized territory. According to the United States Census Bureau, this unorganized territory has a total area of 17.2 km² (6.7 mi²). 16.5 km² (6.4 mi²) of it is land and 0.8 km² (0.3 mi²) of it is water. As of the census of 2000, 442 people reside in the unorganized territory. The population density is 26.8/km² (69.5/mi²). The racial makeup of the unorganized territory is 94.57% White, 3.62% Black or African American, 1.36% Native American, 0.00% Asian, 0.23% Pacific Islander, and 0.23% of other races. 0.45% of the population is Hispanic or Latino of any race. The population is spread out with 4.5% from 25 to 44, 33.0% from 45 to 64, and 62.4% who are 65 years of age or older. The median age is 69 years. Males had a median income of $43,558 versus $0 for females. The per capita income is $24,328. None of the population is below the poverty line. View of the Round Tower. The flag is at half-mast because former American President Ronald Reagan had died just prior to the day the photograph was taken. Delta Air Lines Building C is located on the property of Minneapolis–St. Paul International Airport and in Fort Snelling. Delta uses it for northern and regional operations. In 2009, as Northwest Airlines and Delta Airlines merged, Delta removed all employees from Building A, the previous headquarters of Northwest in Eagan, and all employees who remained in Minneapolis were moved to Building C, which was renovated. Facilities within the building include the Compass Airlines corporate headquarters, which moved there on December 16, 2009. the Regional Elite Airline Services headquarters, and Delta SkyBonus offices. Prior to its disestablishment, Republic Airlines (1979–1986) had its headquarters in Building C. At various times both Mesaba Airlines and MAIR Holdings had their headquarters in the Fort Snelling UT. Fort Snelling Facts for Kids. Kiddle Encyclopedia.